Blue in color, these men's denims brought to you by Red Chief exude a timeless appeal. Displaying a scrapping with whiskers effect and contrast colored stitch detailing for added attraction, these straight-fit denimss have 5 pockets to tuck in all your essentials in a convenient manner. 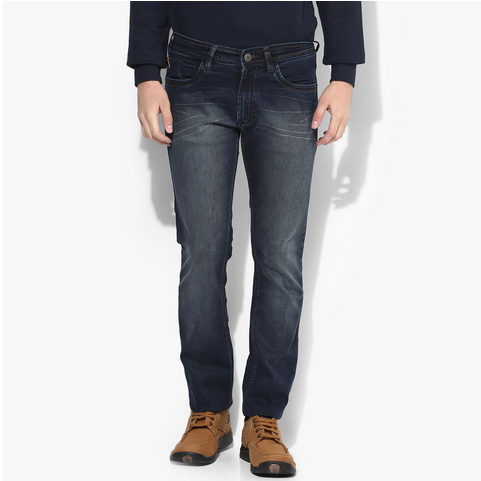 Team these cotton lycra denims jeans with a T-shirt and canvas sneakers. Contrast Thread All Over Body, Branding Leather Patch At Coin Pocket, Contrast Rice Stitch At Back Pocket. 98% Cotton 2% Lycra Machine Wash At 40'c Wash Separately, Do Not Bleach, Tumble Dry, Low Or Line Dry Iron.